Operator ❶ always goes to the left and clears from the center of the room, to the left hard corner. Operator ❷ always goes to the right and clears from the center of the room, to the right hard corner. Operator ❸ always goes to the left and clears from the hard corner to the deep left corner. Operator ❹ always goes to the right and clears from the hard corner to the deep right corner. Their position in the room is not on the walls but a few meters in the room out from the walls. 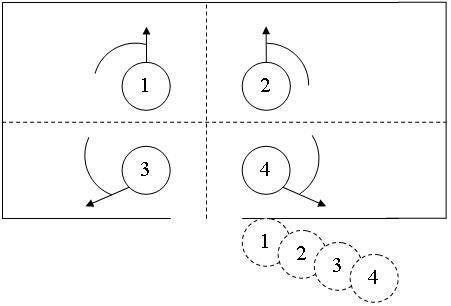 The operators are positioned back to back with a distance large enough, so that other operators can move between them if it is a dynamic assault. This technique is used when the there is a high chance that the walls have furniture lining them.